A pastry shop, yes, but above all a workshop/store, give us a try! A special request? Place an order! The Brian Joyeux workshop: a different approach to traditional pastry. "Our wish is to offer you homemade delicacies, made with fresh and top quality season products, selected with care!" 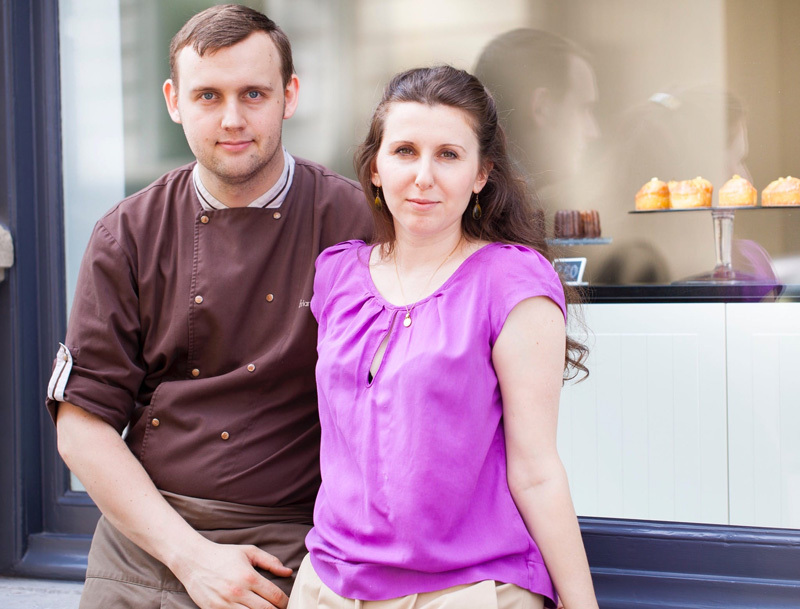 The Brian Joyeux pastry shop: Brian and Anastasia Joyeux have dreamt, imagined and conceived it. The Brian Joyeux showcase: every morning, Brian Joyeux produces a new series of pastries, small cakes and pies, as well as 3 daily cupcakes according to the season and available products. As you walk by the window, you'll see him in action! And Friday it is the rum babas. From Epiphany galettes in January to Christmas yule log in December, we play a happy pastry tune! Take away tea-cakes, sweets and other little goodies. The Saturday viennoiseries workshop: Saturday morning, cupcakes, croissants, puff flake pastry goodies, kooglehopfs, chocolate brioches, etc. are waiting for you at the shop. We also work on order if you desire any during the week. The special cakes workshop: from 2 to 100 people or more, unlimited choice and custom realization to meet your expectations. You can also have a look at our catalogue before placing your order. We do our best to satisfy your needs: individuals or professionals - companies, offices, ministries, restaurants, tearooms, weddings, buffets - everyone is welcome!